DELHI’S NO.1 S.I, ASI COACHING INSTITUTE, TOP 10 S.I, ASI COACHING CLASSES IN SOUTH DELHI, S.I, ASI COACHING CENTRE IN MAHIPALPUR / KALKAJI / PREET VIHAR, DELHI POLICE SSC SI & ASI Exam Eligibility Details, SSC SI & ASI Exam Selection Process, SSC SI & ASI Exam Pattern, SSC SI & ASI Exam Syllabus, SI & ASI Coaching in Delhi, SI & ASI Institute in Delhi, SI & ASI Notification, Test, Preparation, SI & ASI Entrance Exam 2015. DELHI POLICE SSC SI & ASI Exam Eligibility Details. SBP INSTITUTE is the best coaching institute for SSC SI & ASI Delhi Police Exam. Fresh batches for SSC SI & ASI Delhi Police Exam 2015 are going to start. SBP Coaching Institute is the well known coaching institute in Delhi-NCR that provides coaching for SSC SI & ASI Delhi Police Exam entrance exams. At SBP Coaching Institute, we constantly strive to improve our teaching methodology, study material and classroom assignments. The Course Methodology is dynamic as it takes into account the changes that we notice in the pattern of the examination. SBP institute is a professionally managed and organized SSC SI & ASI Delhi Police coaching centre in Delhi, offering best coaching and preparing the job aspirants for the post of SSC SI & ASI Delhi Police Examination. SSC SI & ASI (Delhi Police, CAPF, CISF) Exam Eligibility Details: Staff Selection Commission (SSC) Sub-Inspectors in Delhi Police, CAPFs and Assistant Sub-Inspector in CISF Examination Eligibility Details are given below…. ADDRESS: L-323, STREET NO.7, MAHIPALPUR EXTN. NEAR V2 MALL & SAPTAGIRI HOTEL NEW DELHI – 110037. ADDRESS: TA -93 TUGLAKABAD EXTN. NEAR P.N.B. BANK & ALLAHABAD BANK NEW DELHI – 110019. ADDRESS: A-14 SWASTHYA VIHAR MAIN VIKAS MARG, NEAR PREET VIHAR METRO PILLAR NO. 81, 82 NEW DELHI – 110092. DELHI’S BEST DELHI POLICE COACHING CENTRE, BEST DELHI POLICE SUB INSPECTOR COACHING IN DELHI, NO.1 HEAD CONSTABLE COACHING IN DELHI, TOP 10 CONSTABLE COACHING IN SOUTH DELHI, ASI, SUB INSPECTOR COACHING INSTITUTE IN DELHI, DELHI SYLLABUS, DELHI POLICE TEST PAPER 2015, DELHI POLICE ENTRANCE EXAM 2015. SBP INSTITUTE is the best coaching institute for Constable, Head Constable, Asst. Sub-Inspector. Fresh batches for Constable, Head Constable, Asst. Sub-Inspector Examination 2015 are going to start. SBP Coaching Institute is the well known coaching institute in Delhi-NCR that provides coaching for Constable, Head Constable, Asst. Sub-Inspector entrance exams. At SBP Coaching Institute, we constantly strive to improve our teaching methodology, study material and classroom assignments. The Course Methodology is dynamic as it takes into account the changes that we notice in the pattern of the examination. SBP institute is a professionally managed and organized Constable, Head Constable, Asst. 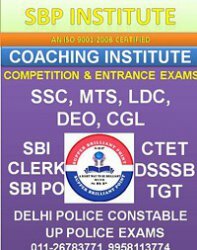 Sub-Inspector coaching centre in Delhi, offering best coaching and preparing the job aspirants for the post of Constable, Head Constable, Asst. Sub-Inspector Examination. Hello friends welcome on our website. This page is designed for you by our website team to give the information of Delhi Police recruitment. As we all know Delhi Police frequently uploads many recruitment notices on its official website. Delhi Police always provides good number of vacancies to the candidates.